Store cleaning supplies in a convenient spot under the sink with Rev-A-Shelf's new wood sink base door storage organizer. These organizers are made of maple hardwood with a UV-cured clear finish to ensure an acceptable match to any of our RTA cabinets. This handy stow-away is available in three sizes for sink base cabinets that are 30", 36", and 42" wide. 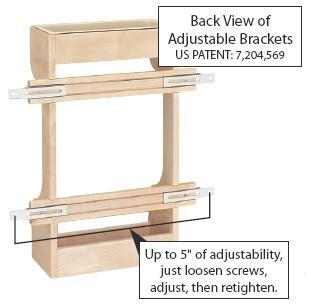 They also feature the pantented adjustable door mount brackets that provide installation flexibility up to 5".